What price the odds on Renault? The Renault F1 team have decided to take the choice of special testing on Friday mornings at the GP circuits before the qualifying sessions on the Saturdays. This option was open to all teams, and they had to choose whether they wanted this extra practice, or being allowed almost unlimited testing during the year. At this stage, Minardi is another team to swap unlimited testing (but not at the circuit for the GP that weekend) for the extra testing at the circuit on the race weekend Friday. Team boss Flavio Briatore has publicly said that Renault are not in the position to fight for the championship this year, and fourth is the best that they can hope for, so the extra kilometres on race weekend in front of the fans suits them better. And gives the sponsors more exposure too. With Toyota also stating that they have their corporate eye on 4th as well, after Ferrari, BMW Williams and Mercedes McLaren, it could be interesting. Throw in Sauber which has been testing very well, with new (re)signing Heinz-Harald Frentzen setting some very respectable times so far and the wild card Jaguar team as well and there could be some interest down the ranks again. Last week I asked about the XK 120 Jaguar and what speed did it do? 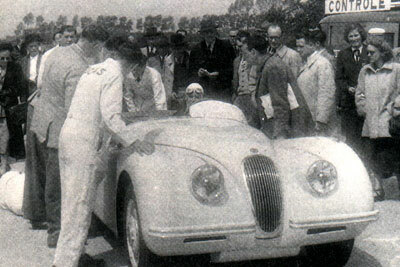 A works prepared XK 120 officially recorded 132.6 miles per hour on the Jabbeke Road record strip in Belgium. This was a left hand drive version too. An unofficial speed was previously set by Motor magazine in the UK at 125 mph. So to this week and still sticking with Jaguar, what happened to the XK 100? Restoring a Ferrari. A 50 year old Ferrari! The Tifosi of today, who cheer for Mrs. Schumacher’s big boy, and who lust after the latest road-going Ferrari’s should spare a moment for the people who have helped make Ferrari the icon it is today. These include not only the late energetic Enzo Ferrari, but also a couple of guys I call Gino and Nino and a lanky Aussie by the name of Ray Helm and his Ferrari 195. 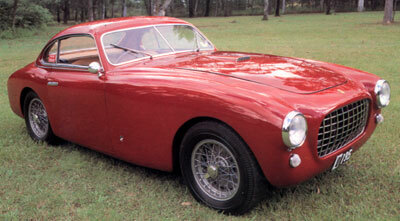 Some of the cars that gave Ferrari its mystique were the 195 Inters, produced between 1950 and 1951. They did not make many of them and the factory concurrently built 166’s and 212’s. 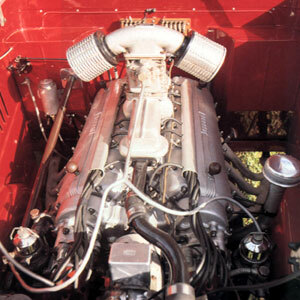 All used the same basic chassis, the main difference being the engine capacity (the model number is derived from the swept volume of one cylinder). The number of “true” 195’s (as opposed to 166’s that were bored out) is thought to be 27, but even the factory is not sure. In a letter to a previous owner of Ray’s 195 the factory admitted, “We are not in a position to know exactly how many cars of this type were manufactured, but we can assume they were very few.” Who said the Italians weren’t capable of understatement! Now Ray’s example has not only a 195 engine, but a special high performance one, a Ferrari 212 close ratio gearbox and twin leaf suspension at the rear, prompting the question as to whether this was the result of earlier restoration, bastardisation or was it delivered like that? You see, they built a road car with what was kicking about, and the cars left as rolling chassis to go to the various body builders in Europe. In Ray Helm’s case, this was to a company called Ghia-Aigle, who were the Swiss Ferrari agents. This company made three bodies, two of which followed the Vignale-Michelotti design, but even they were slightly different. Chassis number 0195EL is one of that pair, and is the one I have personally driven. Ray Helm’s masterpiece of restoration - that took two and a half years. One of the reasons that restoring an old Ferrari can be such a time consuming process is that you cannot get a workshop manual for one of these beasts. Remember that Gino and Nino made the car up as they went along, and the bodies were totally independent from the Ferrari factory. So in answer as to where you go to find new tail light lenses, the answer is that you have to make them yourself from resin, using the original ones as moulds! That’s just what my mate Ray had to do. He did manage to glean a bit of the car’s early history, it was manufactured in December 1951 and bought by Roberto Bellorini, a Swiss engineer working in Lausanne. It was originally delivered in a two-tone grey from the Swiss agents. In 1955 it was bought by Hans Wirth, later to become the European GT champion, but he only kept it for a few months and it went to America. It was purchased by an American collector, Mark Dees in 1971 and at some stage in the US it had been involved in a fairly extensive accident, and Dees had stripped it for restoration, but apparently had given up and sold the remains to Ray Helm in Australia in 1985. It was with that background that Ray began the Herculean task. So many traps for young players became evident. When they put the grille together and then tried fitting it into the bodyshell, it just didn’t fit. Was the grille wrong, or was it the aperture? The final answer was that the American panel shop got it wrong, the grille was OK. I must admit it was a bit of a buzz being asked to drive the Ferrari. 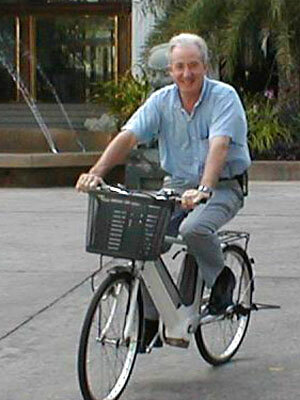 It was certainly no modern sports car when I got my bum in it in 1990. Noise levels were high, the thin wood rimmed large diameter steering wheel felt antiquated, and the twin leaf rear-end made the car very skittish in the tail on anything other than perfect surfaces. I take my hat off to the drivers in the early 50’s who raced these cars in the Mille Miglia, for example. The non-synchro box took some getting used to as well. It is all very fine banging the stick through with impunity, but when the car is not yours and is the concourse winner and valued at over 1 million Aussie dollars, you tend to be a tad cautious! Suffice to say, I enjoyed the opportunity of driving another small piece of history. They don’t often come your way. After having a taste for electric bicycles last year (and for three months the year before, to be truthful) I came to the conclusion that I missed having one of these jiggers at the office. So many times I just needed to pop up the road, to carry out a delivery (not the maternity variety) and even the family Mira was too hard to park. That left me the choice of song taew or motorcycle. Both decidedly risky and patently environmentally unfriendly. 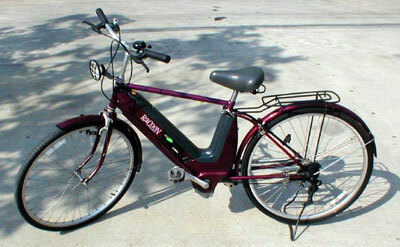 Lekky bikes just made so much sense. The stumbling block for me was just the cost (ah, that Scottish heritage again). Sure, the super mountain bike, with one million gears and twin disc brake job was fantastic and worth every baht of the price, but I didn’t really want to spend way over 20,000 baht just to go to the shopping centre and pick up some headache pills. This is where my live-wire mate Paul Markham from Eco-Brand’s Electric Bicycle Centre came in again, with a low cost alternative, called the Power Assist System bicycles. These are different from the electric bikes I rode last year in that you don’t sit on them, twist the throttle and away you go. In the PAS bikes, there is no throttle as the electric motor is not independent from your pedalling - it just assists you with the job in hand. In actual fact, this is much better from the medical point of view, in that you, the cyclist, have to actually turn the pedals to get the motor to click in, so you are getting some exercise. All very good for the environment, and your ticker! And you can go for up to 40 kays before the battery needs a recharge, but I’m sure I’d find a 7-11 long before then! These PAS bicycles are manufactured in Japan and Paul re-fits them for local use, with straight handlebars and a removable gents crossbar, although you can also get them in standard guise with the Japanese curved handlebars. I tried one of them out, a Honda Racoon, and it was just the ticket! I liked the ticket price too at just over 9,000 baht, complete with battery and charger. So now I am running backwards and forwards again to carry out any messages and deliveries. I am getting daily exercise and after the low purchase price it is costing me nothing to run while boosting my fitness levels. It’s no racer, but the most practical town shopping transport I know of. And it’s kinda cute too! Actually this is the second Honda bike I have owned - the last one was a 1972 Honda 250 cc Elsinore Moto-X racer that I had for 25 years. I hope the Racoon gives me just as good service! I’ll let you know.